For sprues and the manual of the Schwimmwagen and other items in the Academy kit, I gladly refer to the preview found here. A preview of the Eduard set, with a scan of the contents can be found here. 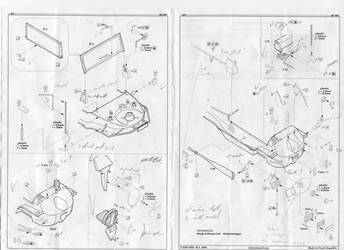 A preview of the MPK set, with a scan of the contents can be found here. While the Academy kit isn't perfect, it is a far cry from the Hasegawa kit in every respect and actually captures the looks of the vehicle quite well. The Eduard set is a masterpiece of PE-engineering but is not for the faint of heart, and I plead guilty to loosing the odd bit or shying away from using the sundry part. 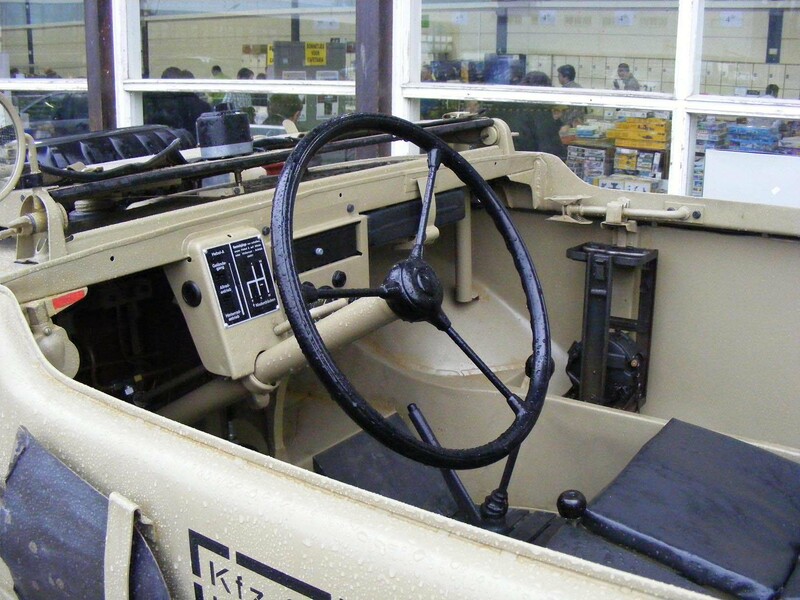 The MK72 wheels were necessary, not only because the Academy wheels are rather poor, but also because the particular vehicle I wanted to replicate had the cross-country tyres. Construction of the Academy kit starts with the lower hull. I only followed the instructions to a limited extent. For instance, I left off the wheels until the very end. Afterwards the instructions of the Academy kit turn to the "tub" which is provided for the interior. While rather good in itself, this was the first step in which I used the Eduard parts. My first attempt was rather inauspicious, as I broke one of the interior fittings that go to the rear of the tub and lost the other. Breaking the PE parts is rather a common occurrence due to the fineness of the parts and the multiple fold lines (6 for this part that is barely 1mm across). Fortunately these two parts will be mostly hidden underneath the rear seats, so I trusted my limited scratchbuilding skills to come up with something similar. 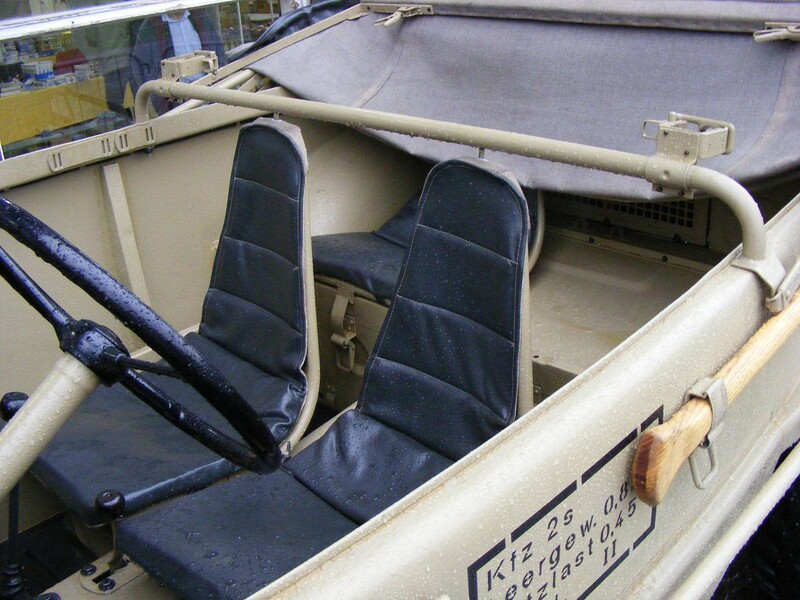 While on the subject of these rear seats: you might want to cut them down by a couple of milimeters, or sand down their base, as they will interfere with the (folded) hood. Either Academy messed up the fit of these parts, or I did, but you might want to play safe. Modifying the parts at the very end of the construction phase is evidently a lot harder then before gluing them to the interior. Eduard provides two bulkheads for the sides of the hull, but folding them was again too much for me, so I replaced them with styrene bits, cut to shape. I won't go into detail about every one of the very numerous PE parts that you need to add at this stage, but I'd like to mention that the fuel tank (part 2) will be mostly invisible and perhaps better replaced by a simple piece of styrene, as (again) foldlines will remain visible otherwise. I left off the clear acetate for the dashboard (and the accompanying PE piece) until the very end. The MG34/42 ammo drums were left off as well. Officially because my vehicle would not have carried them, but also because I had no idea how to fold the PE part into a perfectly circular drum. As an interlude I added the straps to the folded hood and carved some detail into the sides to represent the folded frame. I prepared the exhaust by adding the small U-shaped fittings, but not the metal shield, as I wasn't able to fold it to a shape conforming to the kit part. Next step is the nosejob, where some fittings need to be added to the area in front of the windshield. Again parts were lost (49) and thus replaced with bits of styrene. I left off the tow hooks (front and rear) until the very end by fear of loosing them as well. 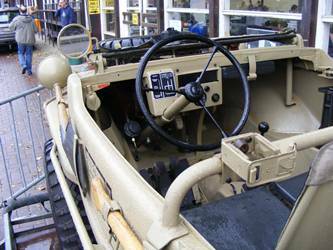 Note that on the rear of the vehicle the nose hook can be folded back. Choosing when to actually join the lower and upper hull is difficult, as it will make adding some PE parts harder and some easier. Moreover, some PE parts might interfere with the fit of the hull. On top of that, you would like to paint most of the interior before gluing both halves together, but with the metal parts left off, that might be unwise. I remember gluing parts on, removing them, adding them again, etc., but lost track which ones I fitted before gluing the hull halves and which ones after that. An experienced modeler will be able to make the judgement himself. For the less experienced.... good luck ! 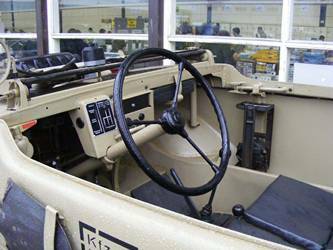 The next step in the Academy manual would have you add the windscreen. I think that's one part better left off until the end. Academy actually offers you two windscreens: one where the frame and glass is in clear plastic, and one in which the frame is plastic and the glass is a separate part. I chose the latter as it eases the paintwork, but which will take some very careful gluing not to ruin the transparency. Eduard provides a new windscreen wiper (even twice, but why ?) and new hinges for the windscreen. The latter were beyond the reach of my modeling skills. Various external fittings (plastic and PE) are next in line, and cause no stir. A nice touch is that Academy gives you optional parts for a deployed and a stowed propeller. 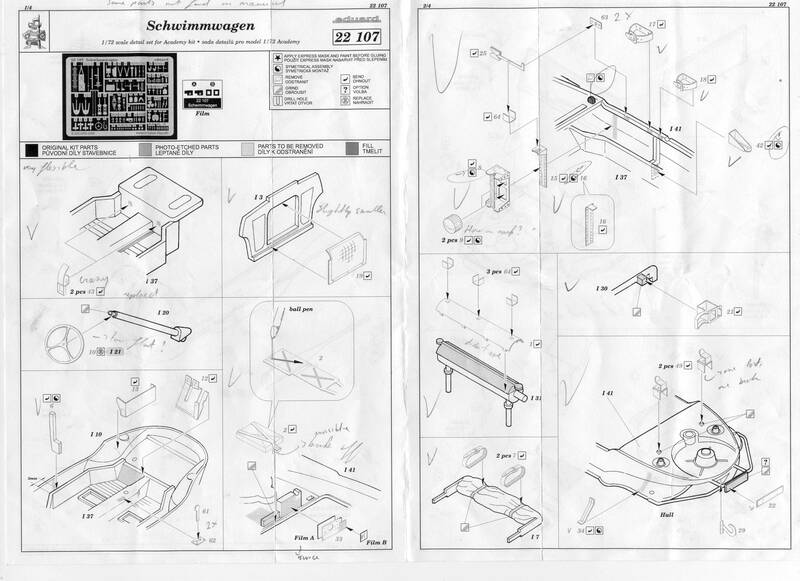 The PE parts to enhance this assembly require you to remove almost everything from the plastic kit parts. 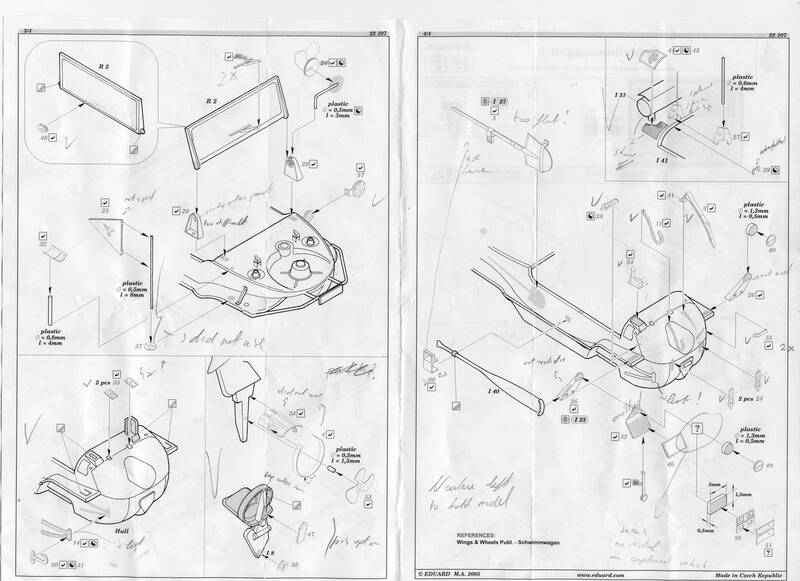 This is evidently not the easiest phase in the construction process, as the annular shield for the propeller and the propeller itself have to be carefully bent. For the record: my propeller would be in the stowed position. One of the stiffeners to which you need to attach the rear tow hooks got lost. It's a pretty big part (as PE goes), but that day the carpet monster was particularly hungry, so I made something similar out of styrene sheet. Still it will need a thin layer of mud to look right. Fortunately, this is one area that catches a lot of dirt. It's a pity that Academy only provides a stowed hood, and, to boot, one that doesn't even fit nor exactly look like a real folded cover would. The oar that is fitted just below it also gets in the way, so this really is an area where Academy messed up quite badly. I needed to shorten the oar by a couple of milimeters to make it fit. As I was trying to build the exact same vehicle as in the picture below, I didn't fit a Notek (neither front or rear), but I did fit the shovel. The picture doesn't show it, but it might have been fitted. I cut off the attachments of the Eduard shovel (which is too flat) and added it to the Academy plastic part. The MK72 wheels are a drop fit as they replicate the fittings of the Academy kit very well. Only minor clean up of the thread and priming were needed. Eduards also provides a command pennant, by the way, which I didn't use. For those building a regular German Schwimmwagen, note that the interior fittings seem to be meant to hold an MP40 and Panzerfaust, and that an MG would probably have been fitted. Personal gear, like canteens and gas masks would be fitted in the (by then) crowded interior. 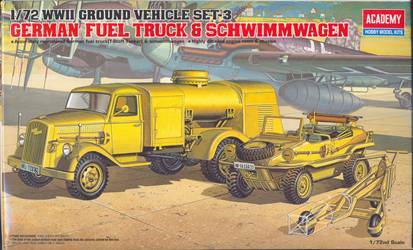 The vehicle was first painted in dark yellow (Humbrol 83) on top of which I sprayed an ad hoc mix of olive green acrylics. Decals (and extra information) were provided by Elliott Winthrop, to whom I am very grateful for that kind act of selflessness. I admit that I failed to notice that I had chosen a bull insignia that faces in the opposite direction as in the picture, but I guess you just could call that artistic licence (or plain stupidity). 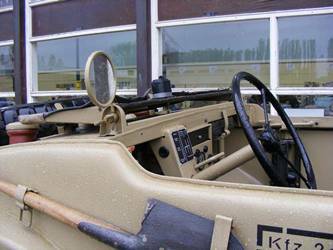 Pictures taken of a restored Schwimmwagen by R. Haelterman (see below). 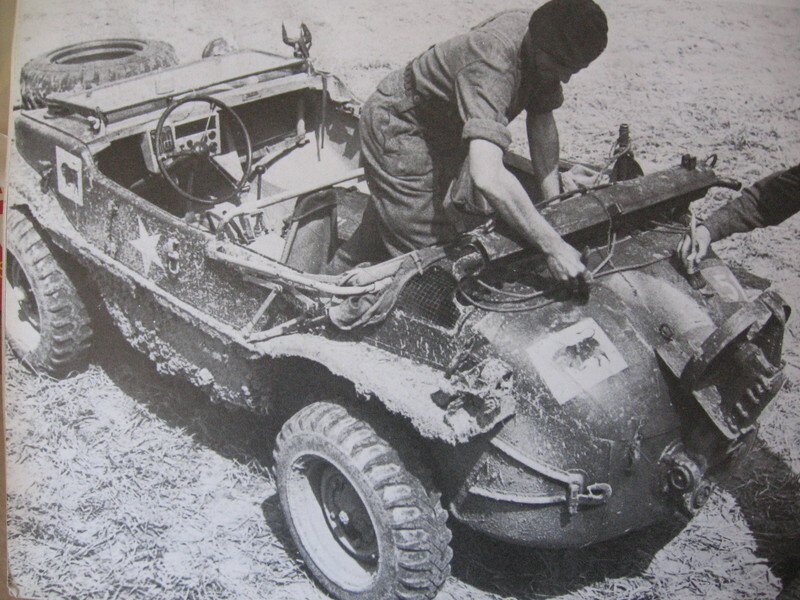 Picture of a captured Schwimmwagen (see below). Notes provided by Elliott Winthrop.